A trade delegation of United Kingdom (UK) is likely to visit the northeast province in the first quarter of next year (2005) to meet the north-east industrialists and entrepreneurs to decide their future activities, said Mr. Dave Waring. 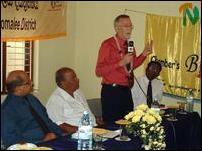 Mr.Dave Waring, First Secretary (Commercial), UK High Commission in Colombo. "I have come to the east port town of Trincomalee as the first leg of my fact-finding tour in the Northeast Province to meet local industrialists and entrepreneurs and to prepare a report on the ground situation and based on views expressed by local business leaders to be forwarded to my country's business leaders," said Mr. Dave Waring. "My next visit is to Jaffna district on Thursday where I would meet members of the Jaffna Chamber of Commerce and industrialists and business community," said Mr. Dave Waring. Mr. Dave Waring further said till now foreign investment had taken place in Sri Lanka focusing only Colombo and not other areas. "Now British trade community is willing to invest directly in northeast and south of the country," said Mr. Waring. Mr.R.Rajarammohan, Secretary Trincomalee District Chamber of Commerce and Industry in his introductory speech said no development has taken place in the Northeast Province since Sri Lanka gained independence due to political reason and also Trincomalee is on the wrong side of the map. Following the outbreak of violence in 1983 about fifty 55,000 families were displaced from Trincomalee district, Shops were burnt looted and burnt down. "We have been branded as people living in war zone for the last two-decades. Main obstacle for development in the district that business leaders are not provided with easy access to credit facilities," said Mr. Rajarammohan. Captain Charles Gnanakone, Director of the Humanitarian rehabilitation Services of North East (Lanka) Ltd was also present at the event. Mr.Geetha Fontgallon, Chief Executive Officer, Trincomalee District Chamber of Commerce and Industry proposed vote of thanks. Mr.Dave Waring speaking at the meeting. 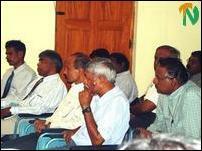 Sitting from left: Mr.Rajarammohan, Mr.Thurairajah, and Mr.Geetha Fontgallon. A section of the Trincomalee business leaders and representatives of BOI (Board of Investment ) and BDC (Business Development Centre) present at the discussion.